Why Do We Need DevSecOps? If you want a simple DevSecOps definition, it is short for development, security and operations. Its mantra is to make everyone accountable for security with the objective of implementing security decisions and actions at the same scale and speed as development and operations decisions and actions. Every organization with a DevOps framework should be looking to shift towards a DevSecOps mindset and bringing individuals of all abilities and across all technology disciplines to a higher level of proficiency in security. From testing for potential security exploits to building business-driven security services, a DevSecOps framework that uses DevSecOps tools ensures security is built into applications rather than being bolted on haphazardly afterwards. By ensuring that security is present during every stage of the software delivery lifecycle, we experience continuous integration where the cost of compliance is reduced and software is delivered and released faster. The benefits of DevSecOps are simple: Enhanced automation throughout the software delivery pipeline eliminates mistakes and reduces attacks and downtime. For teams looking to integrate security into their DevOps framework, the process can be completed seamlessly using the right DevSecOps tools and processes. A developer creates code within a version control management system. The changes are committed to the version control management system. Another developer retrieves the code from the version control management system and carries out analysis of the static code to identify any security defects or bugs in code quality. An environment is then created, using an infrastructure-as-code tool, such as Chef. The application is deployed and security configurations are applied to the system. A test automation suite is then executed against the newly deployed application, including back-end, UI, integration, security tests and API. If the application passes these tests, it is deployed to a production environment. This new production environment is monitored continuously to identify any active security threats to the system. With a test-driven development environment in place and automated testing and continuous integration part of the workflow, organizations can work seamlessly and quickly towards a shared goal of increased code quality and enhanced security and compliance. The IT infrastructure landscape has undergone exponential changes over the past decade. The shift to agile cloud computing platforms, shared storage and data, and dynamic applications has brought huge benefits to organizations looking to thrive and grow through the use of advanced applications and services. However, while DevOps applications have stormed ahead in terms of speed, scale and functionality, they are often lacking in robust security and compliance. For this reason, DevSecOps was introduced into the software development lifecycle to bring development, operations and security together under one umbrella. Hackers are always looking for the best ways to deploy malware and other exploits. Imagine if they were able to insert malware into an application during the build process, and that this malware was not discovered until the application had been distributed to thousands of customers. The damage to both the customer system and company reputation would be huge, especially in a world where bad news goes viral within moments. Making security an equal consideration alongside development and operations is a must for any organization involved in application development and distribution. When you integrate DevSecOps and DevOps, every developer and network administrator has security at the front of their mind when developing and deploying applications. Organizations that want to unite IT operations, security teams and application developers need to integrate security into their DevOps pipelines. The objective is to make security a core component of the software development workflow, rather than retrofitting it later during the cycle. Automation is good - DevOps is all about speed of delivery, and this doesn't need to be compromised just because you are adding security to the mix. By embedding automated security controls and tests early in the development cycle, you can ensure fast delivery of your applications. Use DevSecOps for efficiency - You are only adding security to your workflows. By using tools that can scan code as you write it, you can find security issues early. Carry out threat modeling - Threat modeling exercises can help you to discover the vulnerabilities of your assets and plug any gaps in security controls. 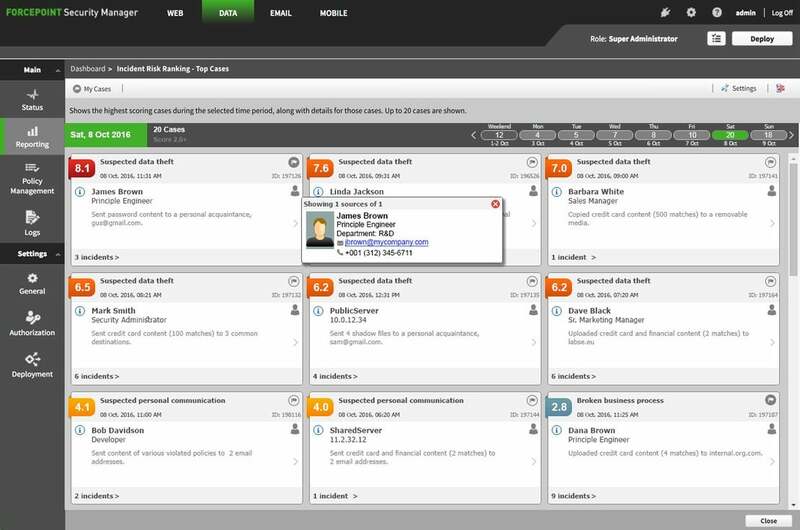 Forcepoint's Dynamic Data Protection can help you to identify the riskiest events occurring across your infrastructure and to build the necessary protection into your DevSecOps workflows. While there is still some consensus on what DevSecOps really means for business, it is plain to see its value in a world of rapid release cycles, evolving security threats and continuous integration.